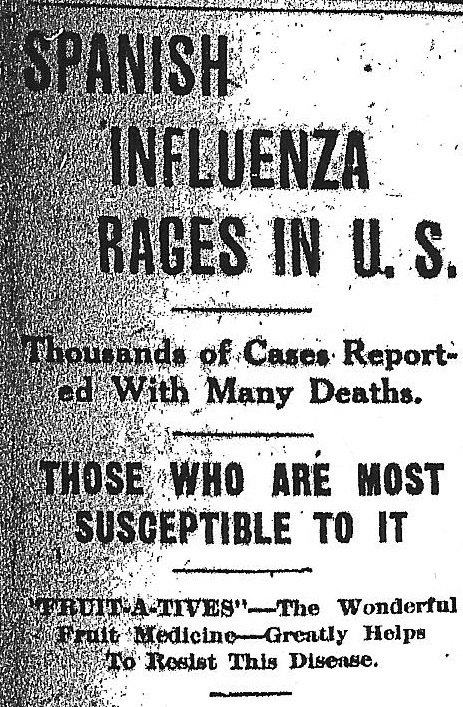 The outbreak of Influenza in our community interfered considerably with our routine work. We kept on the alert to eliminate from school any suspicious case. 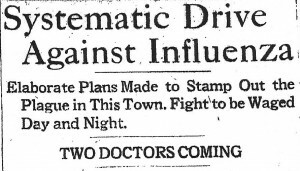 During the epidemic we had to neglect cases of nose and throat, the local hospital being unable to make room for our clinics, and Miss Edith Maxwell, whose valuable assistance we need for getting parents’ consent to operations and making appointments for the same, being herself in charge of the Influenza Hospital. For the same reason we had to defer to a future date cases of defective eyes and hearing. …The town has been divided into districts, each district to be in the care of a trained nurse and such volunteer nurses as may be needed. Yesterday two nurses were on duty, Mrs.Goodermotte, the board of health nurse, and Mrs. Collins, who for the present will be employed by the state board of health. Today two and [illegible] other trained nurses are expected, sent by the state board of health. Saturday evening, Dr. Greaves, who has been helping in the [illegible] work arrived and is answering emergency calls. Another physician, loaned for the purpose by the government is coming today, and one of these physicians will be on duty by day [illegible] by night. They act as emergency doctors, making the rooms of the board of health their headquarters. It is their method to make one call on each patient without other compensation had that made them by the government and then turn the case over to the regular family physician. 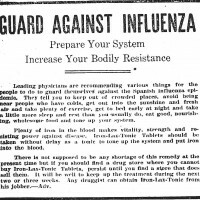 An advertisement for a preventive product, October 1918. 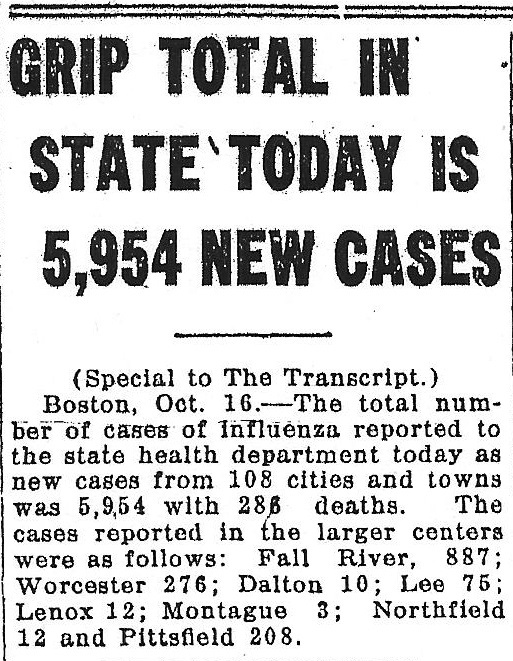 A small blurb in the North Adams Transcript tallies the new cases of Influenza, October 1918. An advertisement for the popular illness remedy “Fruit-a-tives”, October 1918. 1. J.H. Matte and Rosa Fletcher. Report of the Board of Health, North Adams Annual Report, 1918. Massachusetts College of Liberal Arts Special Collections. 3. 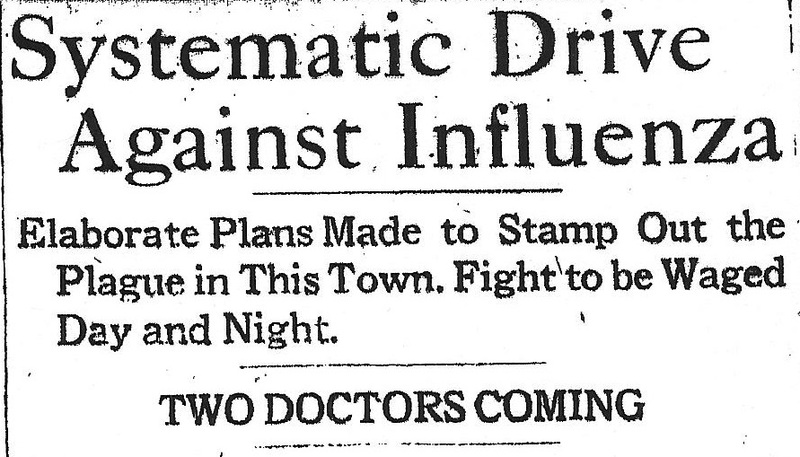 “Systematic Drive Against Influenza,” North Adams Transcript, October 21, 1918. North Adams Public Library. 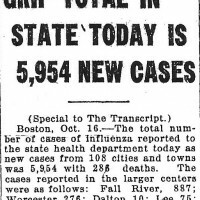 “Grip Total In State Today.” North Adams Transcript, October 16, 1918. North Adams Public Library. 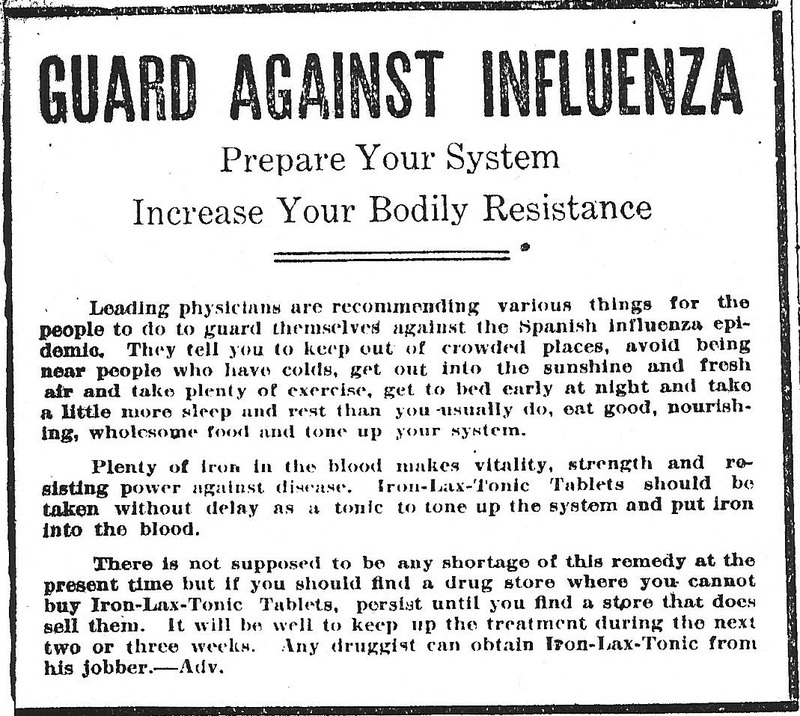 “Guard Against Influenza.” North Adams Transcript, October 20, 1918. North Adams Public Library. 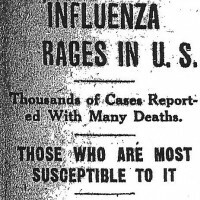 “Spanish Influenza Rages in U.S.” North Adams Transcript, October 19, 1918. North Adams Public Library.